I just rewatched the Skinner original video. Notice 8 weights! I think Skinner was also tapping 7.8hz and didn't even know it! Looking forward to any more information you can share. Possibly a drawing or picture of the complete device. Just look at the environmental input at 8hz! Imagine if these inventors had of known 7.83hz was the resonant frequency! Let's keep the conversation ON TOPIC about William F. Skinner's gravity machine. The one that has an elliptical input at the top as I have said from the beginning. It's right there in the Skinner video - plain as day. Read my posts from the beginning. All claims the top input is circular are false and misleading. All other topics need to be posted in their own threads. Les Banki, "So far, I seem to be the only one here who has actually BUILD something"
Aaron, "All claims the top input is circular are false and misleading." I have to disagree with both of these statements. The upper weight sits at 90 deg. of rotation offset from the lower weight. At zero load, this 90 deg spacing is maintained. The bottom point of the lower weight sits at the lowest point of a tilted semi-circle. As the output shaft at the center of rotation is loaded, the weight tries to climb up the ramp,,, 1/2 of the tilted semi-circle. The lower weight is trying to fall to the lowest point on the 90 deg. ramp. The load is trying to force it to climb the ramp. Centrifugal force is trying to force outwards the top of the lower weight. It is actually trying to force outward the whole weight but, the top of the weight has the most leverage. This leverage is seen as downforce on the end of the aluminum bar. The faster it spins, the greater downforce against the ramp. The lower weight can only fall against the ramp. It can't be driven. The downward pressure exerted by the weight is seen only as weight, not, rotation. The top of the lower shaft is rotated but, decoupled from the rotation of the lower weight. The upper weight only positions the lower weight, it doesn't drive it. It must free-fall. The lower shaft describes a fixed circle as long as the lower weight remains at the bottom of the ramp. As the output shaft is loaded, the weight climbs part way up the ramp and modifies the circular orbit of the "translation plate". My top weight hit the frame a couple of times in early testing. Skinner had to design a drive that could accommodate a varying orbit of the lower shaft. The upper shaft is positioned but, not rotated. The upper weight determines whether or not the upper shaft rotates. The upper weight is locked into the upper shaft. Otherwise, nothing would happen. As the lower shaft is loaded, the translation plate changes it's orbit. The translation plate is just a guide that is dragged along by the upper shaft. The top of this machine runs in a circle. I colored everything to make it easier to separate the actions. Regardless of whether the top orbit is circular or oval, all the same principles apply as far as centrifugal force, leverage and downforce. The tall weight is trying to stay at the bottom of a ramp. The load is trying to force it up the ramp. IF the upper-most orbit were oval, the irregularity would be much diminished by the leverage ration between; the part above the gimbal vs, the part below the gimbal. The translation plate describes a circle of only a couple of inches. Since the translation plate allows for a varying orbit anyway, the irregularity may very well be cancelled by independent movements of the lower weight. I may eventually get around to building the quad device. It is the ONLY iteration that is worth building. In the meantime, I'm building the Terawatt device. The mechanism in the original video clearly shows a small piece rotating at the very end of the oscillating arm meaning the orbit is elliptical. MJN is the only other one that actually gets it and he posted his diagram of it. 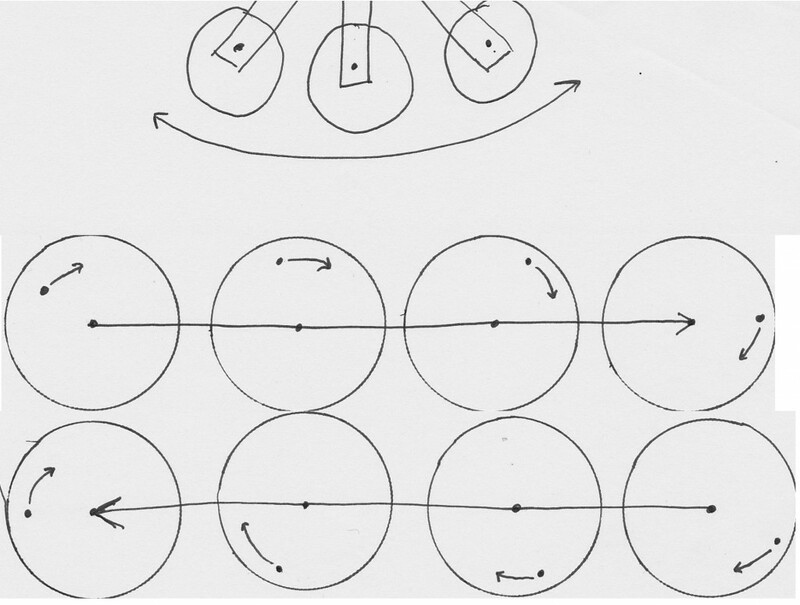 In circular motion, it is nothing but a pure equilibrium machine that will never get a gain. 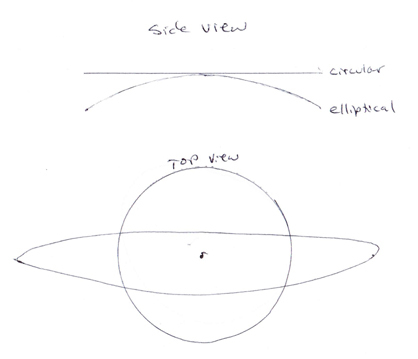 In elliptical motion, the weight changes height and that is where gravity comes into the system to do work - that is not happening with a circular orbit. Last edited by Aaron; 04-09-2018 at 01:09 AM. Watch this video full screen. Read the comments on the video. It is so obvious I'm surprised only MJN is the only other one who gets it. Actually, someone building a full scale model that I'm collaborating with does get it. The elliptical motion is necessary to make the weights oscillate back and forth. That's very interesting work. It would require 12 gears and 8 arms. I see that the debate is raging on. Somebody should just build a full size QUAD machine and find the answer. It is incorrect to claim that this machine is balanced. It runs balanced as a quad machine but, it has enormous strains on the frame work. I used 3/4 inch bolts to attach the machine to a big cement block building. I have over 300 lbs spinning eccentric. This is much heavier than the Skinner machine,,, as a single, not quad. BTW, as the machine speeds up, the upper weight rotates in a larger diameter orbit than it did at slow speed. It makes quite a crash when it hits the frame. I totally agree, there is no connection whatsoever between the spinning masses, it would be a complete failure of logic to propose it is balanced. however a limited amount of eccentric force can be stabilized within the framework.